Sam Lee takes aim in Made in Hong Kong. The Skinny: Made in Hong Kong lives up to its award-winning hype, delivering an unexpected, lyrical, ironic, and powerful look at what it means to be young and facing an unknown and tragically limited future. It's also the best antidote you'll ever find for your Young and Dangerous overdose. 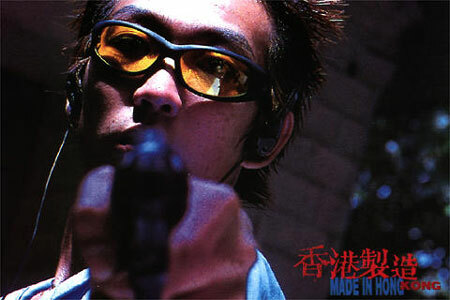 Made in Hong Kong is a rare Hong Kong movie. Aside from being critically acclaimed and award-winning (the film took home Best Picture and Best Director honors at the 17th Hong Kong Film Awards), it's an uncommon Hong Kong example of a true independent film. Famously shot on a shoestring budget using non-professional actors and leftover film stock collected by director Fruit Chan during his assistant director days, Made in Hong Kong is many things: a realistic answer to the popular Young and Dangerous genre, a stylish commentary on urban alienation, a subtle poke at the Hong Kong Handover, and a lyrical and affecting look at what it means to be young and facing the unknown. It's universal and yet unique, obvious and yet obtuse, powerful and yet subtle. It deserves every ounce of its acclaim. Autumn Moon (Sam Lee) is too smart to be a typical triad, saying early on in voiceover that he won't take just any orders. But the life of a goo wat jai is clearly the one he's heading towards. Moon spends his days aimlessly, playing basketball, lounging around, and saving his only follower, a mentally slow lug named Ah Lung (played by Wembers Li, and called "Sylvester" in the subtitles) from bullies. Moon also does occasional jobs for triad Brother Wing (Chan Sang), including debt collection. While on one of Wing's jobs, he meets Ping (Neiky Yim), a pretty teenager whose mother is still paying off her wayward husband's debts. Ping offers to sleep with Moon if he forgets the debts, but he doesn't oblige, though he tries to sleep with Ping anyway. Eventually, Moon discovers that Ping is suffering from renal failure and requires a kidney transplant, but the donor waiting list is long, and without much hope. Ping finds a savior in Moon - or at least, that's what Moon wishes. He falls for her, and through that affection finds some direction, attempting to help her pay off her family's debts, and even going so far as to become an organ donor with the off-chance that one day his kidney will be Ping's. However, that nobility clashes directly with Moon's lot in life: he's a dead-end, lower class go-nowhere and his ability to impact the world is severely limited. And yet Moon still tries, looking for direction through his attachment to Ping, and also through a chance connection with Susan (Amy Tam), a high-school student girl who jumped from a rooftop, committing suicide. Sylvester was a witness, and ended up in possession of her two blood-stained suicide notes. The first letter is meant for her lover, a high-school teacher who tears up the letter and lets it float away in the wind. The second letter is meant for Susan's family, but it remains in Moon's possession, and Susan's presence continues to haunt him in dreams. Susan's loose ends give Moon another chance to accomplish something with his life, but not before coming to grips with what his life really means - or, at least, what he tries to make it mean. And what does Moon's life really mean? Generally speaking, probably not very much, but to Moon, his life is everything, and since the movie is told through his eyes, it pretty much fills our senses for all of Made in Hong Kong's 110-minute running time. What's surprising is how much that life comes to matter. At first glance, Moon is not an admirable person. He may have some righteous values, but his sense of justice is not consistent, and neither are his actions. He sometimes seems ready to do some serious damage, or even to take a life, but then he backs down until he's pushed into a corner, and only then does he brandish a pistol for some retribution. But is it justice, or just the lashing out of a disaffected young man? Moon is far from a heroic figure, and these aren't the movies - though Moon sometimes seems to think it is. He plays "Virtua Cop" like he's in a John Woo movie, and when he gets a gun, he practices posing with it Travis Bickle-style. Moon is forever reaching for something beyond what his meager position in life allows. At one point, he even says that he wants to "shock the world." Does Moon ever find the guts to finally matter? Ultimately, Moon probably doesn't matter, but his futile longing to leave his stamp on the world marks him as real. The biggest impression Made in Hong Kong might have made to typical audiences back in 1997 is one of obvious genre demystification. 1996 was the banner year when Young and Dangerous became a box office tentpole and Ekin Cheng a household name. Made in Hong Kong is set in many of the same places as the Young and Dangerous movies (public housing estates, playgrounds, etc. ), but the triad life depicted here is not one to pump your fist about. It's just one way of life, where the triad figures act kind and righteous when it serves their purpose, but they're also partial to plenty of obvious hypocrisy. Made in Hong Kong is filled with small, ironic touches that paint the life of the goo wat jai as ridiculous and even pathetic. Moon's actions are not driven by righteousness, nor even by need or logic. Moon's reactions are rash and human, and fueled by raw emotions that feel real. When his mother runs out on him, his first idea is to attack his absent father. He asks his mom for money, and when she hems and haws, he then pulls back his request, only to steal from her. Choices beget consequences, but no judgement of Moon is ever offered by the film. The audience is merely a witness. The real power of Made in Hong Kong isn't in its obvious cinematic flourishes, though those are actually quite strong. Even though it's an indie "art film", Made in Hong Kong is still home to some compelling, and decidedly flashy style. Slow motion, flash frames, expressionistic colors and framing - Fruit Chan employs all of these techniques, and their usage could easily be dismissed as empty. Superficially, they are, but if the whole film is Autumn Moon's perspective, then it only makes sense that a little flash occur here or there, especially when he imagines idealized events, like the desired notion that he's some sort of triad hero. This is the film's biggest strength: Moon, himself. He's not a hero, but he's not a victim, a perpetrator, or a foil, either. He's just a fully-realized character, dealing with the hand he's been dealt, and his flaws and sometimes misplaced desires make him utterly identifiable. His voiceover is an asset, showing us who he is without explaining every last bit of exposition. The film does possess its hackneyed conceits (triad themes, terminal diseases, etc. ), but filtered through Moon, they all take on personal, defining meaning. Moon merely attempts to deal with these things, and any lessons we learn are ones that we gleam ourselves. However, Made in Hong Kong does attempt many things that have been done before, and also since. Thanks to its more overused devices and sometimes obvious style, one could view the film as loaded and designed to affect, but the film works so well because of how Fruit Chan fuses his elements together. The style is not intrusive, and instead allows us to greater understand Moon and his world. That his world is so filled with conflicting emotions and small, sometimes ironic details is what gives the film its color, and perhaps also its confusion. Some details in the film aren't necessarily easy to explain, and there never seems to be a defining thematic point to the film. These are things that perhaps only Fruit Chan can properly explain, but the images and emotions resonate. There is manipulation in Chan's technique, but it affects effortlessly, placing the viewer within the protagonist's world and his emotions. The film surprises and exhilarates with its wit and irony, sometimes taking turns that the audience may not immediately understand. Some things are expected given the film's supposed genre - prescribed villains return, vengeance is attempted - but these elements show up at unexpected times, usually creating complex emotions. There seems to be a living, breathing world in Fruit Chan's frame. The film even possesses some subtle commentary on the Hong Kong Handover. Targets for triad hits turn out to be unassuming Mainland businessmen, and the portrayal of Moon's life as clearly dead-end speaks volumes about some of the bubbling emotions Hong Kong people may have felt facing 1997. The film ends with a Mandarin radio broadcast stating how youth are the future, but there is a limited ceiling for the characters in the film, created by the world in which they're born and perpetuated by their friends, neighbors, and especially themselves (a social worker constantly urges Moon to change, but the message doesn't seem to stick). People latch onto what's around them because that's all they have, having been marginalized into the corners. Autumn Moon even laments that he isn't noticed by the cops. Eventually he acts, gun in hand, but the audience response does not seem predetermined. Maybe we're supposed to feel righteous agreement, maybe we're supposed to be horrified, but that feeling is not clearly indicated to us. But it is definitely felt, because Autumn Moon is someone that we get to know intimately. Much of this has to do with Sam Lee, who originally had no acting aspirations and was only accidentally discovered by Fruit Chan on the street. Lee is more of a personality than an actual actor, possessing a range that's wide only when compared to your standard two-expression popstar actors. But Lee has natural charisma and a physical presence, and embodies his wiry frame with something that can only be called real character. Lee seems like a guy you'd see on the street, swearing at someone in Cantonese, and this quality obviously makes Autumn Moon seem all the more real. Lee's gift isn't his actual acting range, but an innate ability to actually exist in front of a camera, be it as wacky comedy relief, key character actor, or unlikely leading man. Made in Hong Kong may be considered Fruit Chan's finest achievement, but discovering Sam Lee gives that idea some competition.